It was hard to select a topic category for this entry because 'technically' what I made is related to bookbinding. But I'm using the end product for something else so I'm classifying it as a Box. Remember the other day when I had an 'aha moment' on making a slipcover for my metal box of colored pencils. I wanted to do this so they would look like the other materials in the stack of Bible journaling supplies. I searched on YouTube and found a great set of four videos by bookbinder Sage Reynolds that were extraordinarily detailed and perfect for my purposes. He covers every detail that leads from raw board to a beautiful and completely custom slipcase. You can watch yourself at https://www.youtube.com/watch?v=ccWnUQqFyKg&list=PLKThD7m8NDz7k4HVV0g27Sjzrd3RgkujP. I didn't have some of the materials he used so I mounted the lining paper with spray adhesive, assembled the case with Ranger's Glossy Accents, and attached the cover papers with a foam brush and Matte Medium (generally used for collage). The lining paper is Tim Holtz's Idea-ology Melange Tissue Paper from a roll. The cover paper is Dollar Tree kraft gift wrap. I added a spine strip so it would liik more like the other box 'books' in the stack. This was a scrap of mulberry paper. I was so excited to show you this project that I didn't wait for the glue to dry before taking pictures. This explains any dark areas on the papers, especially the spine. Well, I must say, this turned out every bit as good as my 'vision'. 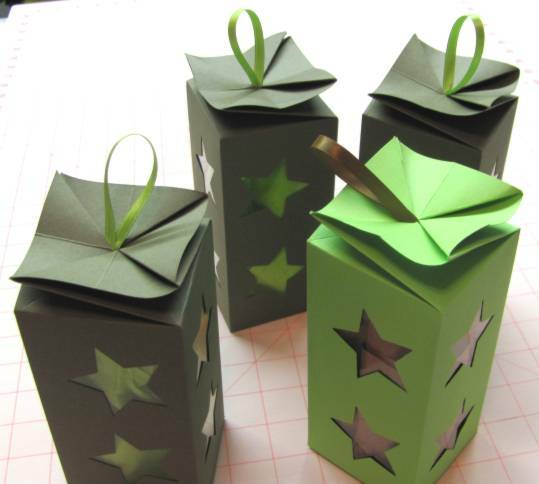 I have always liked the boxes creates by Amazing Paper Grace (blog) called the Twist Top Box. I made one a couple of years ago when she first posted the directions. For the speaker and musicians at our retreat I created custom ones to go in their gift baskets. I did three in chocolate cardstock with apple green accents and one in apple green with chocolate accents. 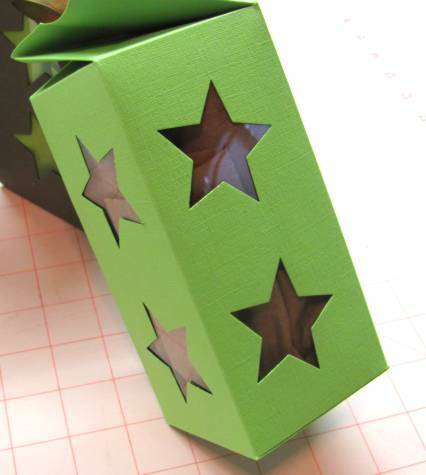 I used my star punch to create the side cutouts and lined the sides with pieces of transparency. They have tissue paper tucked into them so the candies will be contained. The ribbon loops on top are just taped inside the twist. They are decorative and not meant to carry the weight of a filled box. 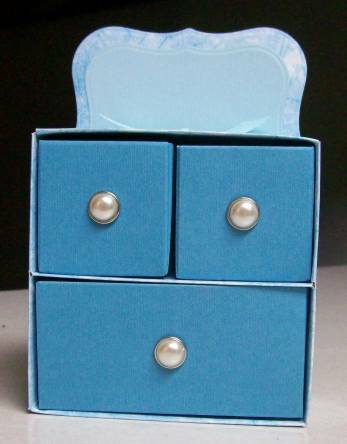 I found this project at http://qbeesquest.blogspot.com/2009/10/darling-drawers.html and could not wait to make one of my own. I used printed cardstock for the cabinet and solid cardstock for the drawers. A Nestabilities labels die was used for the 'mirror' element using some of the printed card scraps and a bit of light blue solid card. I added pearl-faced brads for drawer pulls and tied a grosgrain ribbon at the back of the cabinet. 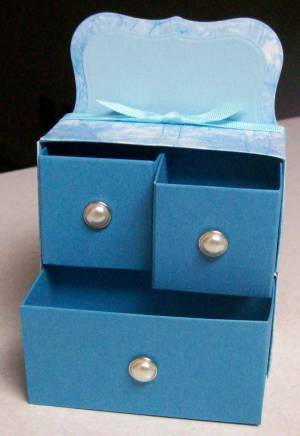 This makes a pretty and solid little dresser using 5 sheets of cardstock.